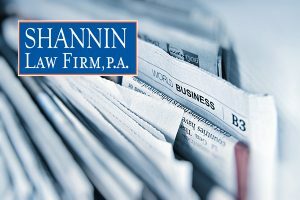 Business Law Appeals - Shannin Law Firm, P.A. When businesses are involved in lawsuits or some other type of legal proceeding, the dispute sometimes ends before a lawsuit is even filed. Other times the dispute ends after a case is decided by a jury and a judgment is rendered. Frequently, however, the final decision in commercial cases does not occur until after a judgment is entered and an appeal of that judgment is taken. This is where an experienced appellate law firm comes in to file various business law appeals. In a lawsuit, the business becomes either the plaintiff (the entity filing a lawsuit) or the defendant (the entity being sued). After a judgment is entered and an appeal is filed, the entity who lost the case (which could be the plaintiff or defendant) becomes the appellant, or the entity applying to a higher court to reverse the decision of a lower court. The best appellate law firms can help a business navigate their way through this difficult process and increase the chances that an appeal will be successful. The Shannin Law Firm has represented business and construction litigation clients before the Florida Supreme Court, the U.S. Court of Appeals for the Fifth Circuit in New Orleans, the U.S. Court of Appeals for the Eleventh Circuit in Atlanta, and the U.S. Supreme Court in Washington, D.C. When the stakes are high, having a specialist for the appeal can be critical in maximizing the client’s chance for success. Board certified appellate attorney Nick Shannin is ready to discuss how we can put our experience to work assisting you with your important and complex matters. Two additional considerations for business law cases include Writs of Certiorari and Amicus Briefs. “Writs of Certiorari” are meant to be used only rarely. The word “certiorari” comes from the Latin term meaning “to be informed” and is often abbreviated as “cert.” In its most basic form a petition for writ of certiorari is a filing to a higher court from a party who is seeking to have a lower court’s order reviewed. If granted, the writ quashes (voids) the lower court’s order. It is a discretionary writ that can be denied, meaning the higher court is declining to hear an appeal. Writs of Certiorari can be issued from an appellate court while the primary litigation is ongoing under very specific circumstances. Those circumstances are particularly prevalent in business law cases, where issues of protecting trade secrets or confidential information can be of paramount importance. A Florida Bar Board Certified appellate attorney can be of great assistance in prosecuting (filing) or defending such a writ. The best appellate law firms have the experience and knowledge needed when it comes to writs of certiorari.